﻿ IPWatchdog.com | Patents & Patent Law! According to the data and stats that were collected, 'IPWatchdog.com | Patents & Patent Law' channel has an outstanding rank and belongs to Intellectual Property category. The channel mostly uses long articles along with sentence constructions of the advanced readability level, which is a result that may indicate difficult texts on the channel, probably due to a big amount of industrial or scientific terms. 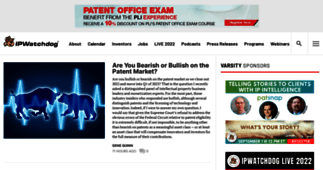 Medium-length materials prevail on 'IPWatchdog.com | Patents & Patent Law' that may be an effective tactic to grip their readers’ attention with a wider range of helpful content. There are also longer items making up more than one third of all articles, which can provide a deeper insight into their subjects. Moreover, there are a few short articles. Advanced readability level of 'IPWatchdog.com | Patents & Patent Law' content is probably targeted at well-educated subscribers as not all readers might clearly understand their texts. There are also articles with medium readability level, which make more than a quarter of the channel’s content. Unfortunately IPWatchdog.com | Patents & Patent Law has no news yet.